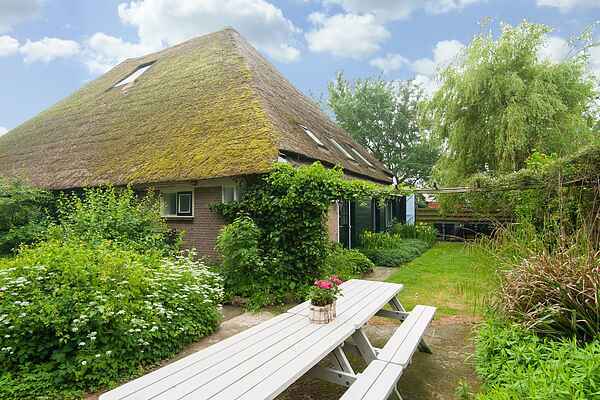 Holiday Villa De Dars, is located just outside the village 't Zand in the middle of the typical Dutch country side, wide views, flower and cabbage fields and windmills. The Holiday Villa is located approximately 6 km from a long sand beach. The Holiday Villa has plenty of space to accommodate 10 people and is part of an 125 year old authentic Northern Dutch farmhouse. The Holiday Villa is equipped with all modern conveniences, is cozy and has a large outdoor space. A stay at holiday villa The Dars, has all the ingredients for a great holiday, a house with character, beautiful nature a long sandy beach, but also various folk cities like Alkmaar Schagen and further away Medemblik, Hoorn and Enkhuizen. Of course there are several museums, cinemas and shopping malls in the area. For children there are, apart from the beach, various options, such as zoos, game parks and swimming pools. Several canals and waterways invite you to canoeing trips. The lakes (such as the Amstel Lake, west of Wieringen) are available for various watersports. A canoe route card shows you the most beautiful spots. The region is ideal for fishing enthousiasts. Various canels, ditches, and streams and waterways attrack plenty of fish. A network of bicycling paths ensures that you can bike until your heart's content Ranging from a few kilometers for the average bike rider to the multiple of that for the seasoned cyclist. Various bycicling toutes are availeble at the tourist office. In spring time the area betweenDen Helder and Petten changes into a flower carpet, there is no better way of seeing then to ride between them on your bike. The head of North Holland is an excellent walking and cycling area and tourist hikers can visit the cities and villages of (cultural) tours, and nature areas are a beautiful setting for walking. Maps and plans are available at the Tourist Office stores. Travel to Den Helder and take a ferry to Texel where you can hire bicycles for a day of cycling and site seeing Seal Rehabilitation Centrum Ecomare at Texel. At Ecomare the Maritime and Beachcombing Museum in Oudeschild, and at the Ancient House in Den Burg is a combination ticket for sale witch will greatly reduced the entrance fee for these museums. The Maritime and Beachcombing Museum wil show you that the life of the islanders not only connected is by the sea by fishing, For many centuries the islanders where beachcombers they go at ungodly hours to the beach for beachcombing. This used to be a necessity for most residents,they were as poor as a church mouse and searched (free) wood to build and comfortably off for the winter. Today it is still done because cheaper materials can not be found! A beachcomber told Texel Jutterij in the museum (if sufficient demand) daily about his experiences with the sea and opponents of the authorities. The Naval Museum in Den Helder, the history of the navy in the picture. In the buildings of the Naval Museum on the shore its permanent and exhibitions on the history of the navy to see. Important part of the museum are the three museum ships: The submarine Tuna, ramschip the Scorpio and the minesweeper Abraham Crijnssen. Indoor and outdoor fun. Games and water fun in Tuitjenhorn! The Holle Bolle Boom offers plenty of fun for a successful day out. You are not depending on the weather, because there is plenty to do inside and outside. We have namely three experiences: the 'Inside' Out 'and' splash '. You can choose a experience, but you can also combine them! Amusement park the Goldfish Welcome to the nicest park in the north of North Holland. A large park where you can go in any weather. Including a huge outdoor 3 large covered speelparadijzen and a cafeteria with extensive terrace. Take your father, mother, grandparents along to this exciting and memorable event, because they have free entrance! Zoo Come to the uniqueness of Blanckendaell Tuitjenhorn Park and discover how animals from around the world nice to live together. Besides many animals in the zoo, the park also contains a museum with historic farm, a playground, a cafeteria and several nice terraces.